The Solo Travel Series: Thailand (Bangkok). 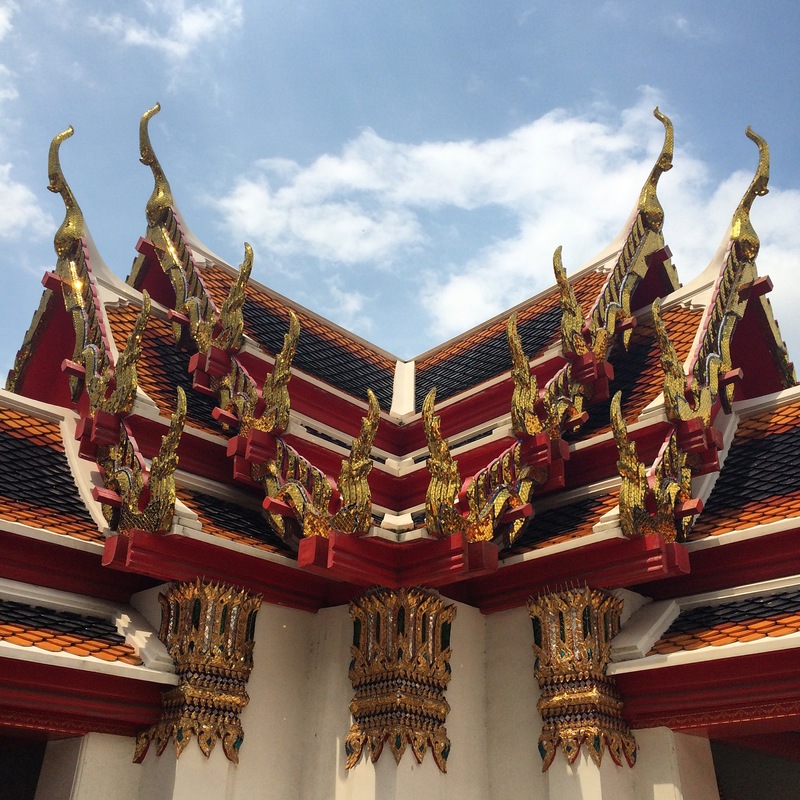 I’m starting off this series with a post about my few days in Bangkok. I flew from Singapore to Bangkok and stayed there for three nights, two full days. I have been to Bangkok plenty of times; it’s a city my family and I frequented mainly when we were living in China and Vietnam. I’ve spent New Years Eve’s on Kao San Road (as a 14 year old with my parents and little brother, so they weren’t the wild night you might be picturing!!) and seen most of the main sites. Regardless, I was excited to explore the city again on my own. The Thai vegetarian festival was on while I was in Bangkok, which was mainly located in China Town. So of course I, always having food on my mind, headed on over. It was a boiling day, I got lost 4 times, and walked around aimlessly for about two hours. While a part of me was annoyed by this, it did give me to opportunity to get off the beaten track a little, and see the less touristy part of Bangkok, which I enjoyed. The festival itself was just countless food stalls selling vegetarian food (I’m not complaining! ), and I picked up some yummy treats. From China Town I walked to Wat Pho; a temple complex close to the Grand Palace. I decided to go here because my lonely planet guide promised me it would be less busy, and it was. It was beautiful and I happily explored the complex for a few hours. Overall my first day was great, if not a little hot, but I did feel very overwhelmed by the city. The amount of traffic and people everywhere made me feel a bit claustrophobic, and to be honest, I was very happy to head to my hotel room in the afternoon for some quite alone time. I did venture out that night though, to go to Veganerie, a place I had heard so much about via Instagram. They basically specialise in vegan desserts; anything from granola to red velvet waffles to sugar free carrot cake. As I went there for dinner, I tried their avocado sushi and the banana nut smoothie; both were divine. I also got the berry granola slice and carrot cake to go. This place definitely made my day a whole lot brighter, and yummier. Day two was a bit of a let down; mostly on my part. Because I had been so overwhelmed by the city the day before, I wasn’t too keen on doing much. Shamefully I spent most of my day in my hotel room catching up on TV series. It’s an example of how my anxiety really does impact my life; as much as I try to beat it, sometimes it just kinda ruins my day. But I did end up forcing myself to leave my room and headed to Bangkok shopping central, Siam, to see what it was all about. I wasn’t really in the shopping mood though, so after picking up some instant ramen from the grocery store, I headed back to my hotel to eat it there. So yeah, not the best day, but that’s okay sometimes too! I treated myself to three nights in a budget hotel; as I’m going to be spending the next six weeks in shared accommodation, I thought I deserved three nights of privacy. For me, travel is all about balance; it’s okay, and sometimes needed, to treat yourself a little. Overall, as much as I love Thailand, Bangkok is not my favourite city. It’s definitely worth a visit, as there are so many cultural sights to be seen, but for me, I enjoy a bit more quite. So I was happy to board my flight on Saturday morning to head to Ao Nang, Krabi, a beachside town I’ve been to many times in the past, but was so excited to visit again. I got to Ao Nang yesterday, and right now as I’m typing away on my ipad, I’m feeling very out of my comfort zone, but more about that in the next post! The Solo Travel Series: Thailand.